Tohoku tote and aprons… heh, heh. More at-the-last-minute Christmas presents! I made this Tohoku tote for my sister. I was so happy when I was making this — I remember when it was really hard for me to make bags and I’d sit and stare at the instructions after completing each step (zoning out, sometimes, but still). When I was making this bag, though, I only needed to look at the instructions while I was cutting the fabric. Yay! This weekend, I also worked on some Secret Santa presents for our big family Christmas party. There’s going to be more, but I finished these dish soap aprons. I think they’re hilarious! 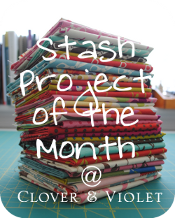 Edit: I’m linking to Clover and Violet‘s Stash Project of the Month. I keep buying fabric when I see sales, so I rarely buy project-specific stuff anymore. Yay for stash! I love the fabrics you used and the bow on the bag rocks! Thanks for sharing! Minimini book bag and a tomte Stuff got added to my Christmas to-do list!